window manager in good old days. Although this looks complicated, the required features are not that many. - GRUB needs to put a background image. 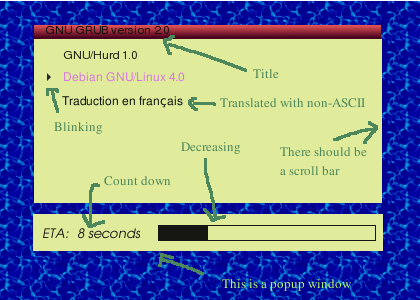 - GRUB needs to put text at arbitrary points. Note that the important thing here is that they must be entirely customizable. necessary is mostly some manipulation features of image data.